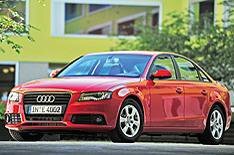 Green Audi A4 diesel launched | What Car? Audi's cleanest A4, the 2.0 TDIe, is in showrooms now. Engine stop-start and brake energy regeneration technology come as standard with every manual A4 2.0 TDI and 2.0 FSI, but the 'e' gets extra green tweaks in the form of lowered suspension, low-friction tyres and an aerodynamic underbody panel to further improve efficiency. A fuel-saving, higher-geared six-speed gearbox further increases the Audi's green credentials, along with a power steering pump that operates only on demand. There's also a display on the dashboard that tells the driver the most energy-efficient gear to be in. Emissions of just 120g/km and average fuel economy of 61.4mpg result, and that puts the 2.0 TDIe in the 13% bracket for company car tax - the 118bhp and 141bhp 2.0 TDI models both fall into the 18% category. Business users who pay 40% tax can expect monthly bills of just £101. Prices start at £23,340 for the standard model. That's 85 less than the 141bhp 2.0 TDI model and 600 more than the 118bhp 2.0 TDI. There's a £980 premium for SE trim, but S line trim isn't available. The Audi A4 2.0 TDIe is on sale now, with deliveries starting in October.